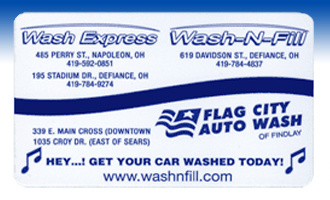 If you enjoy a clean car, then our pre-paid Wash Cards are for you. A great way for saving money and you won’t have to worry about having cash on hand. Wash Cards also make the perfect stocking stuffer, Father's Day gift, or any time gift. 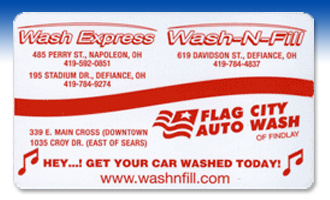 All wash cards come with handy detachable vinyl coupons for easy redemption of your prepaid vehicle washes. Valid at location(s) shown on card. Can not be used with any other coupons or discounts, unless otherwise specified. Limit one coupon per customer, per visit. Price on all items includes sales tax. All rights reserved. ©2011 Wash-N-Fill Car Washes.